Joyce Colson wrote this poem a few days ago about the severe weather we are having here in the Pacific Northwest and I thought it was very cute and appropriate. Oh' how we all pray for a "White Christmas" but now that we actually have one, 2 days of lost business and 2 broken pipes later we can't wait for the snow to melt and get back to normal. Full of wintry white and beautiful snow. And children listen to the frozen wind’s call. Or ice sheets spread wide their cheer. By the crowded snowy malls. And the frozen poor come in for their meals. While the fireside dries out their frozen, soggy clothes. Many people don't know that Working Girl Wines support women and families across the country. Wherever the wines are sold we donate 2% of the sales to worthy causes. All the local $$ raised in our home town has already been promised, but in the spirit of community and the season we wanted to do a little extra for a specific family in need. Purchase a Case (12 bottles) of Working Girl White or Handyman Red for $120 and we will donate $60 to the Calloway Family. David and JoAnna Calloway moved their family of 4 from California to Sequim, WA. In July 1991. Both found jobs right away, David with Angeles Millwork and JoAnna with Sequim Safeway. They have raised their family here, JoAnna started a small cottage business, The Lavender Peddler and her business has flourished over the past 5yrs. David started his own business, Calloway Tractor, and has worked with many local builders and homeowners in the area for the past 4yrs. Cayte, their daughter, now 26 is a hair stylist at Sassy Kat in Port Angeles and is expecting her first baby and JoAnna and David’s first grandchild in March 2009. Garret, their son, has worked in the family business, Calloway Tractor, along side his dad for the past 3yrs. In August, David was diagnosed with terminal pancreatic Cancer and began chemotherapy immediately. The first series failed to work. David is now undergoing a new treatment of chemo that is leaving him weak and ill.
JoAnna has taken a leave of absence from her job at Sequim Safeway to stay home and take care of David. With no income, their medical and household bills steadily rising, and the threat that they could also loose their home, friends and family are trying to support the Callaway’s any way they can. To order online put "Callaway Family" in the comments section of the order form or call the winery (360) 452-0160. It's that time of year again for the Cranberry Jubilee. We're bottling today and will start shipping tomorrow. With the ever growing popularity of this holiday wine, get your order in early. This year's blend is 80% Chardonnay and 20% Cranberry wine. The label is the same with our Working Girl Elf (picture above). There's still plenty of time to make sure you get your order in time for Thanksgiving. Perfect for the holiday table and truly decadent with turkey leftovers. Don't forget to put yourself at the "Top of the List". Displayed on our long farm table in our appropriately named “Gathering Room” it just speaks to me… I can almost smell my mother’s dressing; see my father carving the turkey and my son sneaking treats to our Scottish terrier under the table. As the holidays approach, we get a lot more questions on food and wine pairings. And after doing a little more research and reading the overwhelming amount of advice, I found some notes that banished all the complexity and stress. Even for me who’s in the wine business this was a relief… and it pairs nicely with my innate desire to Gather. After all, much of the appeal of Thanksgiving dinner is found in the kitchen with wonderful aromas enveloping all the cooks! So here’s a fresh look at what you might offer. It’s the perfect time to serve your wines 'family style,' the way you serve your meal. Just open your selections and let your guests help themselves to the tastes they like. And of course, if you have that special bottle of prized wine in your cellar, bring it up for the holidays. But here’s where most people make a mistake. Typically they like to make their special wine the showcase, serving some less expensive variety beforehand. Before dinner, open that prized bottle and let people enjoy all its delicate flavors -- without food affecting the taste. And while all are savoring the bouquet, you might actually get a word in and offer that special toast to those most special in your life. After this, the food takes center stage. So serve several bottles of food-friendly, not so expensive, wines that blend well with the wide variety of dishes on your table. Then, sit back and enjoy your gathering. Ps. Wine suggestions and a Holiday “Gathering” Wine Package Below. Most holiday wine recommendations include Chardonnay, Rose (off-dry to dry), Riesling, Gewurtztraminer, and off-dry Sparkling Whites along with Reds such as Pinot Noir, Zinfandel and Syrah. We’ve crushed our last grape (Cabernet Sauvignon) and are ready to celebrate the Harvest. This year’s vintage will be one of the best in the winery’s history and we look forward to celebrating this harvest with great food, wine and friends. The 2nd year is now a tradition… The Harvest Celebration Dinner will again be held at Joy’s Wine Bistro in Port Angeles, WA. We typically do a press release, especially for our local media. This one, though, is something special, worth sending out beyond our local borders. It features the culinary and winemaking accomplishments of Joy Siemion of Joy’s Wine Bistro and our winemaker, Benoit Murat. If you are planning a visit to the Peninsula soon or would enjoy wine touring in your own backyard , the annual Passport to Autumn Wineries Tour will be held on Saturday and Sunday, November 8-9. Several times each year, Joy Siemion, chef and owner of Joy’s Wine Bistro and Joy’s Bistro at Peninsula College , both in Port Angeles, can be found working around the country alongside internationally-renown chefs such as the Food Network’s Bobby Flay and Giada De Laurentiis. 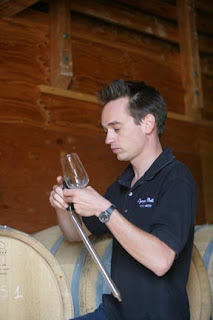 Similarly, while his wines age in barrels at Olympic Cellars, you might find Winemaker Benoit Murat working the harvest at Cloudy Bay , New Zealand’s most famous winery, or studying the latest winemaking techniques in France. Each of these local culinary talents is committed to continuously augmenting their skill and expertise to bring Port Angeles diners an exquisite gastronomic experience. On Nov. 8 , Siemion and Murat will join forces in presenting La Gerbebaude 2 , a winemaker dinner showcasing seasonal Olympic Coastal Cuisine expertly paired with locally-made wines. The event will take place at Joy’s Wine Bistro , with seating at 6 p.m. Tickets are $55.00 per person. For reservations, call 360.452.9449. Siemion recently returned from the Food Network New York City Wine & Food Festival, one of the largest televised cultural events of the year featuring the best and brightest stars of the culinary world. 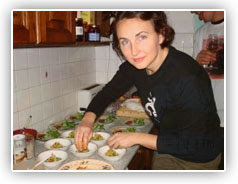 Now in her 10 th year as culinary stage production manager, Siemion and her crew take care of every behind the scenes detail for celebrity chef demonstrations on a particular stage. This includes receiving chef recipes, ordering and receiving food, prepping ingredients, organizing ingredients for the stage demonstration, trouble shooting, and directing the chefs on camera. Siemion’s crew supported Chefs Bobby Flay, Lidia Bastianich, Rachel Ray, Rocco DiSpirio, Tyler Florence and Iron Chef Masaharu Morimoto at the New York event. In February, Siemion will be off to South Beach, Fla. for the South Beach Wine & Food Festival, and in June she will work the Aspen Wine & Food Festival. “I return from each event feeling personally challenged, and look forward to applying the new knowledge and techniques I learn in my own business,” says Siemion. French native Murat was educated in enology and viticulture and began his winemaking career in the Bordeaux region of France. Seeking to experience winemaking in different parts of the world he came to the United States, and has since traveled to winemaking areas in New Zealand, Italy and other parts of France. He reads constantly to keep up on what’s happening in the industry, and confers with other winemakers regularly. Murat’s personal winemaking style is a mix of the techniques he’s learned around the world. Working closely with Siemion, Murat carefully creates the wine lists at Joy’s Wine Bistro to complement her culinary creations, and often recommends some delightfully surprising pairings. Seating for La Gerbebaud 2 is limited, and early reservations are recommended. Is the United States a Dinosaur? Back in the late 80s, early 90s there was a revolution in the corporate world. Competition went global and high-tech garage shop start-ups were beating the pants off the big corporate giants. Individuals driving this change thought differently, worked differently and had the vision and guts to change our world. I worked for one of those corporate giants… Texas Instruments, and I can vividly remember the day a magazine article compared my company to a Dinosaur and forecasted our extinction. All I thought about was if I was going to lose my job and what the President was going to do so I would be OK. I didn’t feel any responsibility for the outcome. I was paid to a do a job and felt no responsibility for the “Company’s” problems. As I look back on those early bleak days and the decisions the leaders of TI made to save the company, I can’t help but compare it to our economic and political arena of today. Twenty years ago I was asked to do more with less, think out of the box, automate, outsource, downsize and CHANGE. It wasn’t easy. People lives were impacted. Sacrifices were made. Personal agendas had to be set aside for the greater goal... A strong, focused company that had a strong bottom line, a competitive portfolio of products and intellectual capital better than their competitor. Today…well it’s hard to look to the future when you’re just trying to swim to shore. But folks, if we focus on today and the short term, it might be OK for our life time, but what about our children, what about our future. I do believe we are facing extinction if we all don’t take personal responsibility. It’s so easy to point the finger. Pull the entitlement card. Bury your head in the sand. An ‘in my face’ blast from an old boss that I will never forget: DON’T COMPLAIN IF YOU’RE NOT PART OF THE SOLUTION. Get out the vote for Olympic Cellars Winery! 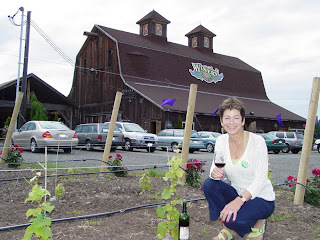 Only a couple days to go: Get out the vote for Olympic Cellars Winery! Over the past three weeks, voters have helped make the Evening Magazine's Best of Western Washington the best guide for the insider's scoop on everyday decisions in the Pacific Northwest. Over 98,000 votes have been cast, but it's not over yet...voting continues until October 13th at 7pm and we need your help to finish out strong. The voting results will be hidden for the next few days to build suspense until we officially announce the winners beginning October 27th. After the Contest Voting ends October 13th, but the guide is available year round. Evening Magazine's Best of Western Washington is powered by CityVoter. As a citizen and now a small business owner I’m outraged in the gross lack of leadership in our members of Congress. Stories are prolific on the Internet but two statements jumped out as demonstrating again POLITICS AT IT’S MOST SELFISH BEST regarding the financial bailout plan. With a United States and Global financial meltdown potentially eminent, how could any elected official worry about his/her campaign or their state’s constituents? May sound harsh, but what good is shortsighted pork belly politics if the entire country is driven into a depression. We need LEADERS who can think, ask questions and make the hard decisions under pressure in the BEST INTEREST OF THE UNITED STATES! 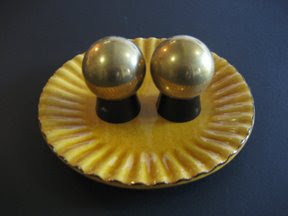 And, if you need a pair of Brass Balls to help, I’m sure there are a number of citizens who would order a pair delivered straight to your office. Maybe you need a New Symbol of Leadership, Responsibility and Action. I can’t believe Saturday, September 13 is our 6 th Grape Stomping Harvest Party. I grew up watching I Love Lucy … of course they were re-runs! Who would have thought my life’s destiny included a red wig and a Lucy ‘get-up’ hosting a Grape Stomp at Olympic Cellars. The I Love Lucy show aired for 6 seasons, 1951-1957. This year, our 6 th Stomp, will also be our Last . In 2009, the Grape Stomp & Harvest Party will evolve in conjunction with the winery’s 30th anniversary. So while saying good-bye to a seasonal favorite, those who have enjoyed the event over the past six years and those who may experience it for the first time this year can look forward to a surprise next fall. If you always planned to join us AND… if you always wanted to get really close to the grapes, feel the squish between your toes and the excitement of stomping then mark your calendar for Saturday, September 13 from 1 p.m. – 6 p.m.
And, if that’s not reason enough, how about a count down to the…. 4 . Opportunity to win Kathy’s 6 year-old pink flannel Lucille Ball Grape Stomping Pajamas or her red wig! 2. It is said… "grapes are the most noble and challenging of fruits." Rise to the challenge! Take on the fruit! Stomp and swamp your way into OLYMPIC (Cellars) history. The last and final 2008 Grape Stomp Champion! Saturday, September 13, 1 p.m. to 6 p.m. I have always enjoyed my glass of wine... especially after that long day at work, battling traffic trying to get to daycare or a soccer game on time, and then to hit home and juggle dinner, laundry and homework assignments. Later I found out my kids called my glass of wine “Mommy’s Little Helper”. In 2001 I took an early retirement package when fate through me a curve ball. I was newly married and got a call from my husband while traveling. He asked me if I wanted to buy a winery. “I guess it would be make good dinner conversation” I laughingly replied… but he was serious! Apparently, my new mother-in-law had co-signed some loans on a winery that was in financial trouble. Here is where fate takes over and shortly thereafter we’re the third owners of Olympic Cellars Winery with a rich heritage on the North Olympic Peninsula and the 15th winery in Washington State. So at 51, I packed up our house in Dallas and moved to Port Angeles. Four days later I am standing behind a bar 7 days a week and working in the cellar. Gone was this corporate lady always decked out with hair and make-up in place and dressed in suit and heels. I found out all to quick that I needed more muscles, fleece, Ecco boots and a crash course on wine production and operations. Molly and Libby joined me, helped rebuild the winery and later became my partners in our women owned winery. Fate again stepped in 2003 when we decided that we were going to develop a wine brand with unpretentious fun labels. We spent lots of time working on the wine blends… maybe a little bit too much time one night. I remembered leaning back in my chair and said, “Ladies, I’m exhausted, this working girl has got to go home”. We all sat up totally alert. We hadn’t been able to come up with a name for the wines and there it was --Working Girl -- 3 women all in second careers, mothers to 6 and grandmothers to 7. So we hired a caricature artist and the wines were birthed: Working Girl White, Go Girl Red and Rosé the Riveter. Running a business was new to all of us. It was our baby and we felt like we were living the American Dream. Early on we knew we could not just schlep wine, we wanted a business with soul and purpose. The Working Girl Wines were Created By Women, In Support Of Women and soon began to support our charity of choice programs. Based on gross wine sales cash donations are made on a monthly basis to local grassroots organizations that support women and families. Donations have grown to over $15,000 in 2007. La Dolce Vida, our premium wine brand, drives another founding principal of our business… Savor the Good Life and Cherish the Memories. Summer concerts, skydiving and the Grape Stomping Harvest party are just a few of our winery events that bring friends and family together. We also self-designated our own holiday, The Working Girl NO LABOR Day Event! The Working Girls go “on strike” that day joining in on our own party. Who would have known that “Mommy’s Little Helper” foretold a new career? The iconic Rosie the Riveter poster hangs in our cellar and delivers a message to us every day… We Can Do It, Too! Maybe my own children never quite understood by first career but it didn’t take my grandchildren long to understand the winery. Harper, my oldest granddaughter, actually gave me my new title. While looking at the t-shirts in our gift shop she stood and pondered one t-shirt that had “Wine Chick” spelled out in rhinestones. Harper turns to me and says, “You’re Grandma Wine Chick!” The name stuck and that pretty much says it all. Remember, Savor the Good Life and Cherish the Memories. Along with the release of our WG Anniversary Wine "Gracefully Aging Red" the anniversary celebration continues all summer long. We thought it would be fun to share some of the fun and encourage friends to take a roadtrip to the winery. We'll even pay for your gas! As you read in my last post, we celebrated National Flip Flop Day Saturday and ushered in the 1 st day of summer. I guess the weather Gods were impressed with our pleading because they granted our wish. Since the email and blog post went out Thursday evening we’ve had nothing but glorious sunshine and warm weather. We actually crossed 70 degrees. It was an Olympic Peninsula heat wave! At the winery, the doors kept opening to the sound of flip-flop, flipity-flop, flop-flop as our guests made their way to the bar. Remember… complimentary wine tasting was in order if you dressed appropriately. The winery was festive with everyone showing off their feet! Molly, our tasting room goddess, really got into it and started saying goodbye with a new twist. “Thanks for flopping in,” she sang out as she poured another round. At the end of the day, Molly was getting a bit slap-happy (or by then, ‘flap happy’). Anyhow, she was serving a group of 5 -- a mother and her four daughters. They were tasting through our wines to pick the ones they would serve in honor of their mother’s 80 th birthday and her 60 th wedding anniversary! Molly was serving them our Dungeness Red Lemberger. Now, understand, not many have heard of this grape and usually say something like, “Is that like the cheese?” No, we say, the grape is spelled differently and smells a whole lot better. Lately we’ve even taken to describing the wine as similar to Pinot Noir. Well of course, everyone at the bar collapsed in hysterics, Molly turned red to her hairline and the discussion quickly turned to the movie Sideways. Seriously though, the name may stink for a grape but it’s all about what’s in the bottle. Lemberger is part of Washington’s heritage and should not be overlooked. These wines truly are very similar to Pinot in style, with a medium-body and lots of bright fruit and soft tannins. It’s a very food-friendly wine and pairs beautifully with salmon, halibut and other food right off the grill. Oh ya. Back to the weather... by Sunday we headed back down to 60. Maybe we just didn’t have enough “Oomph” and not enough lead time. Heck, if we can skydive into the Winery maybe next year I’ll truck in a few loads of sand and we’ll have a beach volleyball tournament and usher Summer with a bang. Stay tuned. Well, I thought I was brilliant… for the last week or so I’ve been espousing around the winery that I was going to declare Saturday, June 21 “National Flip-Flop Day.” The impetus behind this brainchild? Flip-Flops, those fun, colorful, rubber sandals, are in my mind synonymous with summer. And though many of you have already experienced the hot days of summer and are wearing your flip-flops, those of us on the Olympic Peninsula are still waiting and are not sure that summer will ever arrive! By declaring June 21, the first day of summer, National Flip-Flop Day, I thought we could create a little summer fun and hope the sun will follow! Besides, wearing Flip-Flops has good karma and lifts the spirits! Imagine thousands of people (or maybe just Olympic Cellars’ customer list) flip-flopping away on Saturday. The thought just makes you smile! To verify the originality of my idea, I did a Google search (you know you can Google everything. ) On my first search I found that someone else had already bestowed this honor upon the Flip-Flop. Last year Tropical Smoothie, with more than 300 locations nationwide including one in Vancouver, WA, launched its first annual National Flip-Flop Day to ring in the summer season. Dang… they’re serving smoothies but I’m serving wine! On a more serious note, we all know that many Americans are suffering the wrath of Mother Nature this year, and that there is a lot of “bad stuff” happening in our world over which we have no control. We all help where we can but uncertainty can leave you anxious when thinking about the future. Wearing Flip-Flops for one day is not going to solve the issues facing our world and I’m not trying to make light of them. But, we all have the power to make a difference within our own sphere of influence. So take the time to reach out to those dearest to you… celebrate life and National Flip-Flop Day! As we like to say at the winery... savor the moment and cherish the memories. PS. If you live close to the winery, wine tasting is on us Saturday if you walk through our doors wearing your favorite flip flops! PPS. In the Pacific Northwest some might view our “sandal” foot attire as not being at the height of fashion when you have to add SOCKS to keep warm! PPS. We would love pictures for our website! 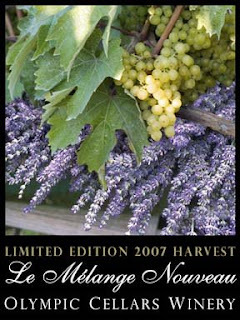 Appropriately named the Le Mélange Nouveau or "The New Blend" Angel Farm’s culinary lavender was infused in Olympic Cellars’ 2007 Madeleine Angevine to produce the first “local terroir” wine flavored with lavender. Both the grapes and the lavender were harvested in Sequim. While terroir is more frequently linked with grape growing regions and defines the special characteristics that geography has bestowed on them. Our local terroir also produces premium quality lavender. The blend of the two, grapes and lavender, in this new wine is a marriage of visions. Twelve years ago Sequim’s Lavender Farms were just a vision… now a flourishing industry attracting international focus and visitors. Our new vision is grape vineyards on the Peninsula producing wine from cool weather varietal grapes that will pair with our local Olympic Coast Cuisine. Bella Italia will pour the wine at Angel Farm during Lavender Festival. On Sunday, during the 12:30pm culinary demo at Angel Farm featuring Lavender Grilled Prawns, Kathy Charlton from Olympic Cellars will pour samples and talk about the wine while Neil Conklin of Bella Italia focuses on the prawns and the cuisine of our region. The wine is in limited supply and will be sold at the winery during Lavender Festival. Women of all ages are invited to gather at the winery in celebration of International Womens Day. The Gathering is an opportunity for women to step out of their busy lives, relax and enjoy the camaraderie of others over homemade soup and bread, and wine. Opening remarks will be presented by Nancy Newman, local activist and organizer of Port Angeles’ first International Women’s Day Celebration. Karen Brown, director of the G.I.R.L.S. Camp, will discuss the camp’s impact on the lives of local girls. Womanfest Board Members Molly Rivard and Martha Rudersdorf will give a PowerPoint introduction to the Mujeres de Maize Opportunity Foundation. Entertainment will be provided by the Olympic Peninsula’s Sequimarimba band. Suggested donations of $10 will support the G.I.R.L.S. Camp and Mujeres de Maize. Olympic Cellars will also donate 25% of the proceeds from wine sold by the glass to the charities. A Tribute to the Lifetime Achievements of Hazel Wolf. Stories of the life and accomplishments of Hazel Wolf, activist and founder of 26 Washington State Chapters of the Audubon Society, will be recounted by Wolf’s daughter, Nydia Levick of Port Angeles, and granddaughter, Ann Sargent of Sequim. Wolf, who passed away in 2000 at the age of 101, exemplifies the difference that a single person can make in our society. A casual chili dinner will be available. Suggested $7 donation will support the G.I.R.L.S. Camp. For more information contact Clare Manis Hatler at 360.683.6967 or Diane Nelson at 360.417.2889. An evening of music and literature. The husband and wife team of Jim Stapleton and Diana Bigelow will present a selection of original stories and songs from their recently released CDs, Sanctuary Reflections and Return to the Sanctuary. The performance is a fundraiser for the premiere production of Women Without Men – A Fable of Modern Iran, a play adapted by Diana Bigelow from a novel by Iranian ex-patriot Shahrnush Parsipur. There will be three performances, August 1-3, in Webster’s Woods Art Park at the Port Angeles Fine Arts Center. Exact Change, an eight-woman ensemble from Port Townsend led by Leslie Lewis, will perform three- and four-part choral arrangements from jazz to pop to classics, and a cappella selections. Writer and poet Mary Lou Sanelli will read from her recent book of essays, FALLING AWAKE, An American Woman Gets a Grip on the Whole Changing World One Essay at a Time, which was selected as “one of the most fabulous 2008 Northwest titles,” by Seattle writer/reviewer Leslie Thomas. Sanelli is also the author of six poetry collections. For more information contact Rhonda Karls at 360.681.7738 or Molly Rivard at 360.452.0160. The League of Women Voters of Clallam County is a nonpartisan, volunteer, member-driven organization established to promote political responsibility through informed and active participation in government. LWV does not support or oppose political parties or candidates. Membership is open to anyone of voting age. 11:00 - 5:00 p.m. each day. This is one of our favorite winery events. We’re tired of the cold and rain and just want to throw open the doors of the winery and invite all to join us for what we feel is our best event ever. You can hear the sultry jazz drifting from our Gathering Room. The Tasting Room is enveloped in a delightful ambiance of people coming together to enjoy the "Magic of the Grape". You’ve wrapped a red cashmere scarf around your neck, while sipping an elegant cabernet with the taste of rich dark chocolate on your lips. Does it really get any better than this? Be the first to sample this big, bold and bodacious cabernet. Starts with an intense rich color, coupled with aromas of oak, vanilla and dark fruit. A wine for Cab Addicts! Guest will receive a decadent, dark, chocolate truffle made by master Chocolatier, Yvonne Yakota. The Working Girls are also making Molly’s special secret chocolate biscotti for noshing. Live Music in the Gathering Room 1-3 p.m. Many people have asked about writing our Congressional representatives or signing a petition. Your help and voice is very much appreciated. Contact information is at the bottom of this page. You can read the Peninsula Daily News & Seattle Times articles here and my email to winery customers below. The winery is still in negotiation with the USOC. More information will be posted as appropriate. Sign up for our Winery Newsletter to keep informed. ...I guess you could send "a message in a bottle"
an Olympic Cellars Wine Bottle! I got a surprise letter in September from the U.S. Olympic Committee stating I was in violation of the 1998 Ted Stevens Olympic and Amateur Sports Act. The Act authorizes the USOC to file a civil action against the unauthorized commercial use of the word OLYMPIC. There is a specific geographic exception in the Act that allows companies to use OLYMPIC so long as their business is local in nature and limited to the Olympic Peninsula area of Washington State. The geographic limitation was added in 1998 and obviously impacts the growth of small businesses. The winery name was changed to Olympic Cellars in 1992. There are many businesses with Olympic in their name including our hospital. I purchased the winery in 1999. The main issue is the use of our website to sell wine to customers that find us on the Internet. An interesting fact is that the trademark attorney for the USOC granted Olympic Cellars the use of our URL in 1999… because he stated no one would be mislead or be confused, i.e. no rational person would connect Olympic Cellars Winery and the Olympic Games. It is also worth noting that the reach and impact of the Internet was well known in 1999. For those of you that visit our site, we have gone ahead and added disclaimers to all of our website pages stating that we have no connection or affiliation to the U.S. Olympic Committee, the U.S. Olympic Team or Olympic Movement. I hope that this litigation can be brought to a resolution without changing our name and losing our business identity and heritage. Thank you for your support. Please email me if you have any contacts that might help our case.